All this week, I’ve been talking about how “experiences” are transforming our culture—and our economy. This may sound “new,” but in some ways this concept rests on a timeless desire for indelible memories that we want to repeat again and again. When I am describing the smells and tastes of a “new” grocery-shopping experience, for example, I’m really talking about reawakening our wonderment for the food we eat. These “new” experiences—many of which really are very old experiences—are tough to stage in our high-energy, high-stress, high-tech world. Let me leave you this week with one last example that connects many of us to a quintessential childhood experience. Remember Santa Claus? I mean, the real Santa Claus—the one we long for in The Polar Express, Miracle on 34th Street or in the best classic department store displays like those in the good ol’ days at Macy’s in New York or Hudson’s in Detroit. What became of that memorable experience? Long, boring lines just to see a mall Santa who is more intent on snapping a fast Polaroid than in awakening holiday wonderment. It’s enough to generate a communal: Bah! Humbug! Doug Johnson—Director, Marketing for Santastic at General Growth Properties, Inc.—is on a quest to make sure no kid ever has that experience again. A few years ago, he approached the large mall development company where he worked with an idea: Let’s put the magic back into the Santa experience! They started with a phrase: “Santa believes in me.” With that one simple statement, they turned things upside down. Gone were the long straight lines kids and parents hate. They were replaced with a fanciful pathway filled with interactive activities to engage and entertain families while they waited. The interactive elements weren’t designed to necessarily speed up anything or slow anything down, they just helped pass the time. 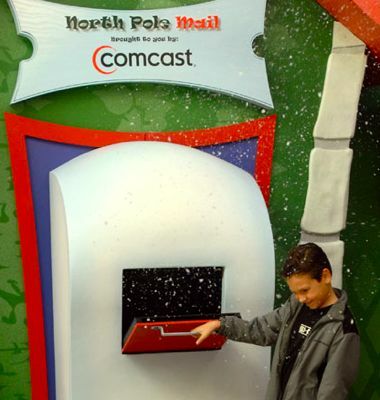 Families stop thinking, “We still have 20 minutes until we see Santa.” Instead, they’re thinking, “We only have a couple of minutes until the next thing we get to do.” The mailbox they encounter isn’t just a mail slot—it’s a magical experience. When kids open the mailbox—snow blows! It’s a direct feed to the North Pole! Remember the dreaded question of naughty or nice? It’s been replaced with the Naughty or Nice machine. When the arrow points to Nice—everyone celebrates! The entire North Pole staff is encouraged to engage with the families in line—including Santa. On a trip this past December to one of Doug’s Santa experiences, I had the distinct feeling that Santa and his helpers were as happy to see me as I was to see them. Doug is quick to point out that creating a great family experience doesn’t mean you need to sacrifice revenue. Just the opposite. Families have a better chance of staying longer in the mall if their wait for Santa isn’t a negative experience. Families come from farther away—and may come to see Santa more than once—if the experience is worth repeating. This year, they tried something new. They brought Santa back for one day after Christmas on December 28th so kids could say thank you. There was some hesitation at first internally because that’s “not part of the story” but it worked. Lines were long and families were thrilled that he was back. Kids brought thank you cards and some of the toys that Santa had brought them. As adults we may have forgotten what a job it was to meet Santa, but to a 4-year old this is a huge deal. What are the experiences in your life that are a huge deal?